On two flights last week it occurred to us that the apparent demise of the once great tradition of handing out sweets on landing and take-off is a not only an sad ration to flyers, but also a missed opportunity for the airlines. Iconic confectionary which becomes part of the ritual of flying with a specific carrier that can be enjoyed on the plane and taken home could be a lovely way of enhancing experience and increasing the reach of your brand. Airlines could produce their own or partner with an existing brand: perhaps a stick of rock from different resorts for British Airways or Life Savers for American Airlines? 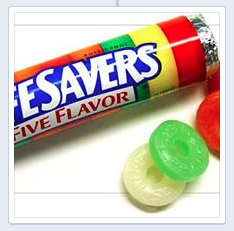 Perhaps not, "Attendants prepare for take-off, LifeSavers anyone? "!